Xiaomi’s sub-brand POCO launched its first phone POCO F1 last month for an aggressive price. The phone packs top-end specs at an affordable price we could never think. 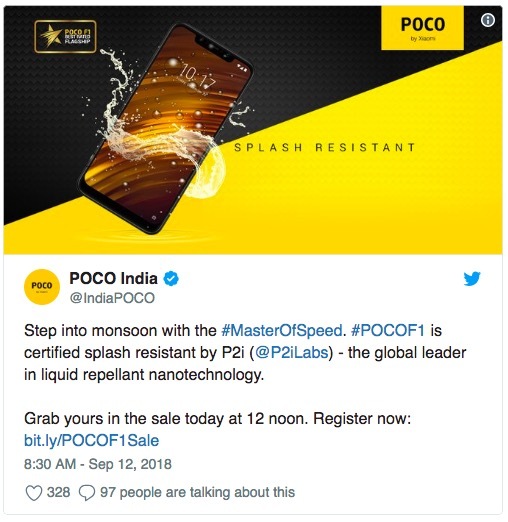 Now the company has confirmed that Poco F1 is splash resistant. The company is not just making claims because the phone is certified splash resistant by P2i, the global leader in liquid repellant nanotechnology. 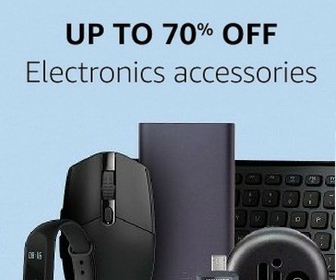 It means the phone can survive everyday splashes and spills. It is not waterproof, so you can’t immerse it in water. I am not sure why the company didn’t confirm this at the time of launch. Poco F1 is already cheapest phone with Snapdragon 845 and water cooling tech in India. I also don’t see any other brand coming with similar kind of aggressive pricing. Splash resistance could be another notable feature to boast and market the product. The company has again confirmed that the phone supports Qualcomm Quick Charge 4.0 out of the box, however they only offer 9V/2A (18W) Qualcomm Quick Charge 3.0 fast charger in the box. Jai Mani, the Head of Product at POCO Global also confirmed that they are rolling out Face Unlock to several regions including India. He also clarified that the phone has 2x smart power amps for offering stereo like effect from the bottom speaker. The phone has 6.18-inch FHD+ display protected with Gorilla Glass. It has Snapdragon 845 and comes in 6GB RAM with 64GB storage,6GB RAM with 128GB storage and 8GB RAM with 256GB storage models. The phone has dual camera setup with 12 megapixels and 5 megapixels sensor. It also has 20 megapixels front camera. It also has IR face Unlock that is secure and fast. The phone also packs 4000 mAh battery. Price of Poco F1 starts at just Rs. 20,999. So, the phone is already in huge demand as people in India do not want to miss this value for money phone. There have been a controversy around WideVine certification. The phone lacks WideVine L1 support, so it cannot stream HD content on both Amazon Prime Video and Netflix. But the company has confirmed that they are looking into the matter and trying to see if they can rollout it this over the air.